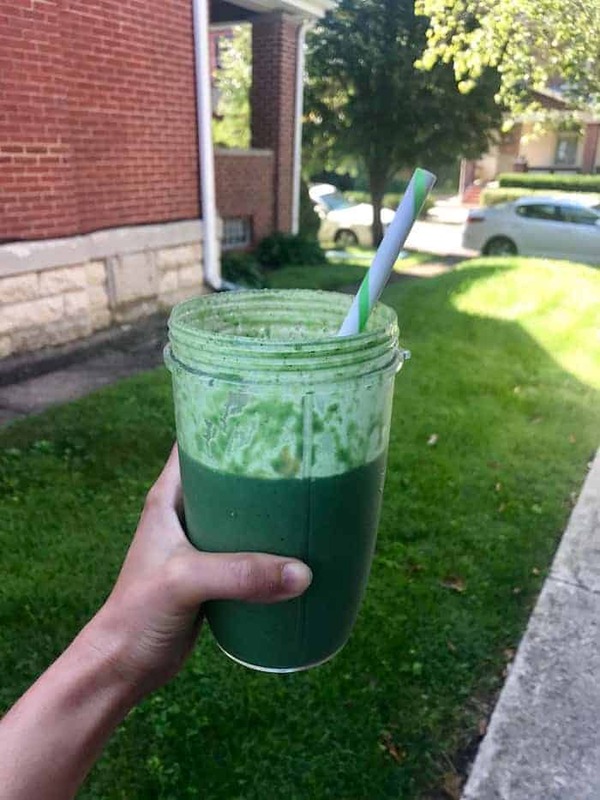 I woke up randomly craving mint chocolate chip ice cream, and I’m so excited to tell you that this smoothie tasted EXACTLY like it. Into my Nutribullet went a bunch of almond milk, a big handful of frozen cauliflower florets, sliced zucchini, and spinach, a scoop of vanilla protein powder with spirulina, a tablespoon of cacao nibs, a big spoonful of cashew butter, a splash of vanilla extract, and 1/4 teaspoon of organic peppermint flavor. I know all the veggies sound a little crazy, but the protein powder is plenty sweet and the veggies are super mild so this seriously tasted perfect. 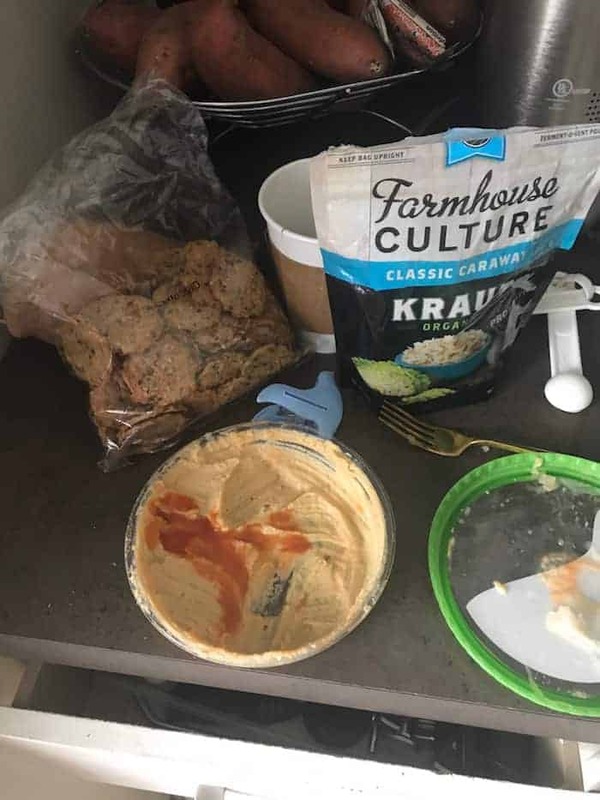 I was craving something savory like ten seconds after my smoothie so I went to town on Mary’s Gone Crackers (I got a big pack at Costco) with hummus + hot sauce and caraway kraut. So random but so good. 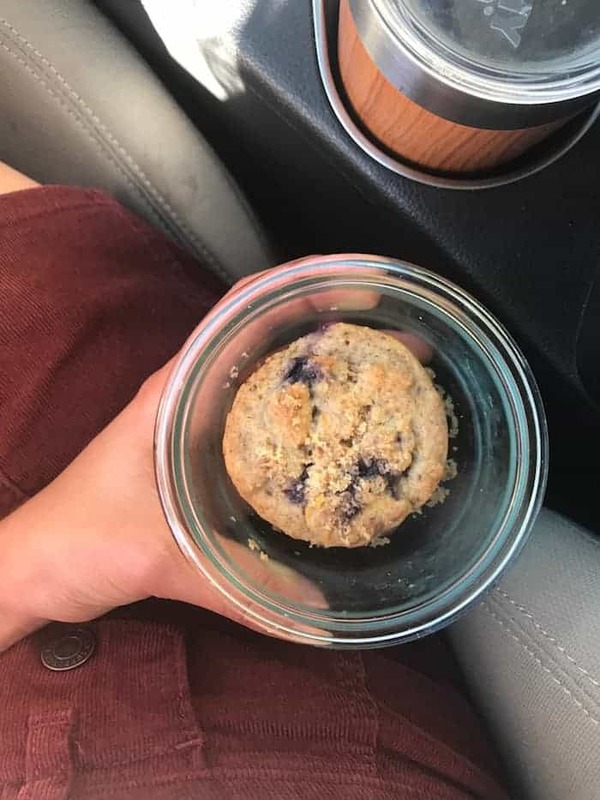 I also had a cold brew with soy milk on my way in. 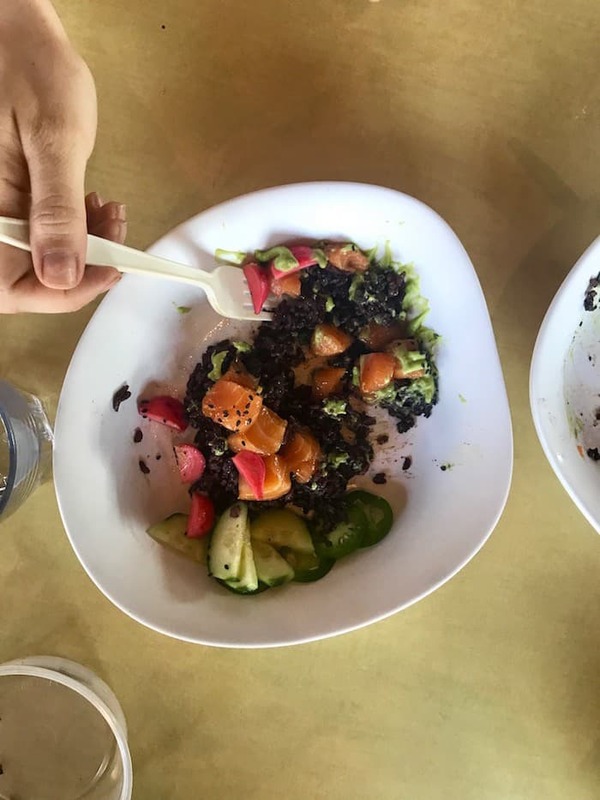 Lunch was a mish mash of things at TRISM including our new poke bowl and “nibula” baked donut. They both tasted as dreamy as they sound! 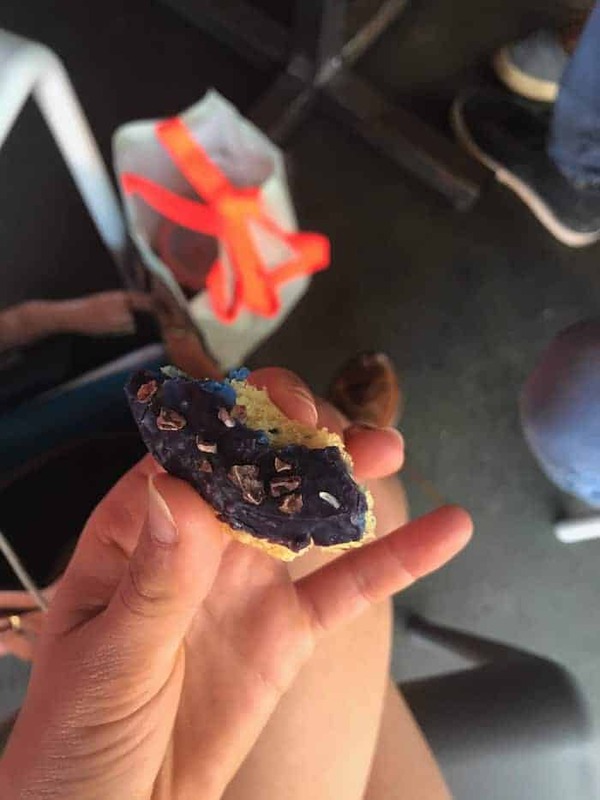 ….and a Blueberry Orange Muffin. The skirt I’m wearing is from Target and it’s the shiz. I have this one and this one too. Your fall wardrobe is calling! 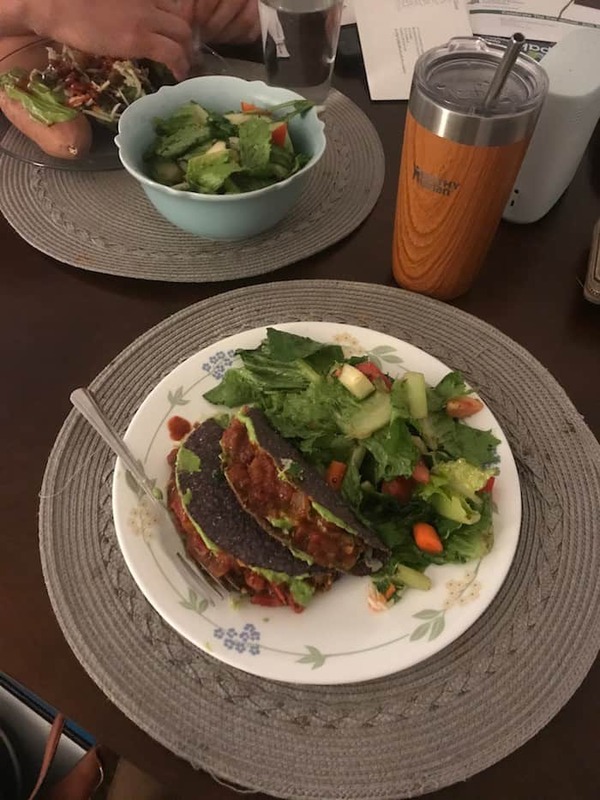 Dinner was the best tacos and a hugh jass salad with all the local veggies! I’ve made these so many times that now the only thing I actually measure is the spices. I ended the night with S’mores Bar that I sprinkled with pink salt and inhaled with immense delight. Hope your week is splendid! 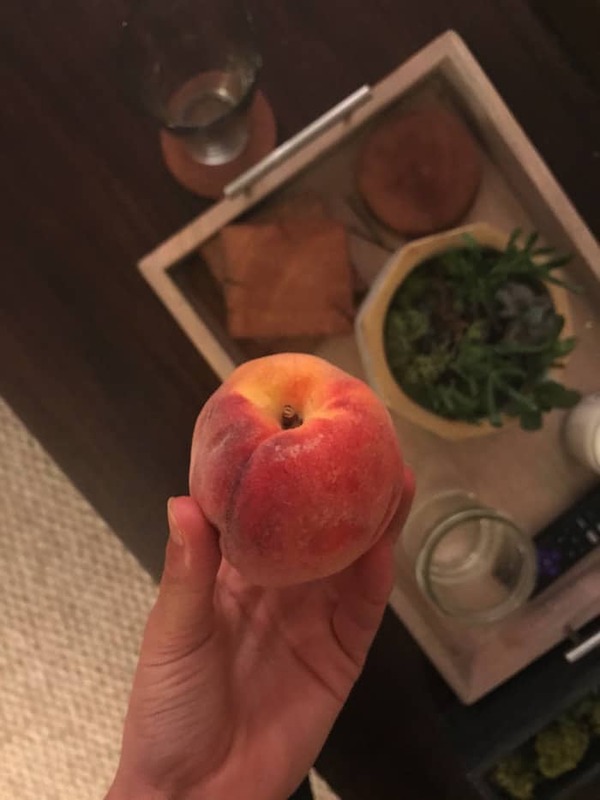 I haven’t been able to stop eating peaches lately! I’m so happy they’re in season, and they make the kitchen smell SO good too! Really wish i had your s’mores bars on hand. They look amazing! Love how you woke up craving mint choco ice cream- such a specifically random one hah! That mint chocolate smoothie actually sounds absolutely perfect right now!! I’m at the beach, so it would be really refreshing. I totally love that skirt too! I’m definitely buying it because, you’re right, it’d be SO awesome for fall. I try adding sea salt to my s’mores. Such a unique little something that I bet adds a world of flavors. those s’mores bars look to die for!!!! and that smoothie, too – i need to get me some peppermint extract and cacao nibs and step up my smoothie game!! mint chocolate chip is literally the most refreshing flavor in summer!! Gonna have to try the smoothie for sure, and those new Alchemy menu additions sound DIVINE! Which vanilla protein did you add that is plenty sweet? Peaches are so good right now! So much good fruit in August. Those tacos look and sound AMAZING! And It’s always awesome when you make a smoothie recipe up on the fly and it tastes EXACTLY like what you’re craving! The recipe for the smoothie in the first image sounds a bit complicated at first, but hey, if it does taste like mint chocolate chip ice cream, I’d say it’s totally worth the effort! Definitely trying this one! I see you have a link to the Hawaiian spirulina. That isn’t a protein powder, is it? I always find cauliflower tastes a little off in my smoothies…. any tips??? Maybe I need to use a better protein powder to “cover it up.” Anyway, mint chocolate chip ice cream for breakfast sound like my kind of breakfast! 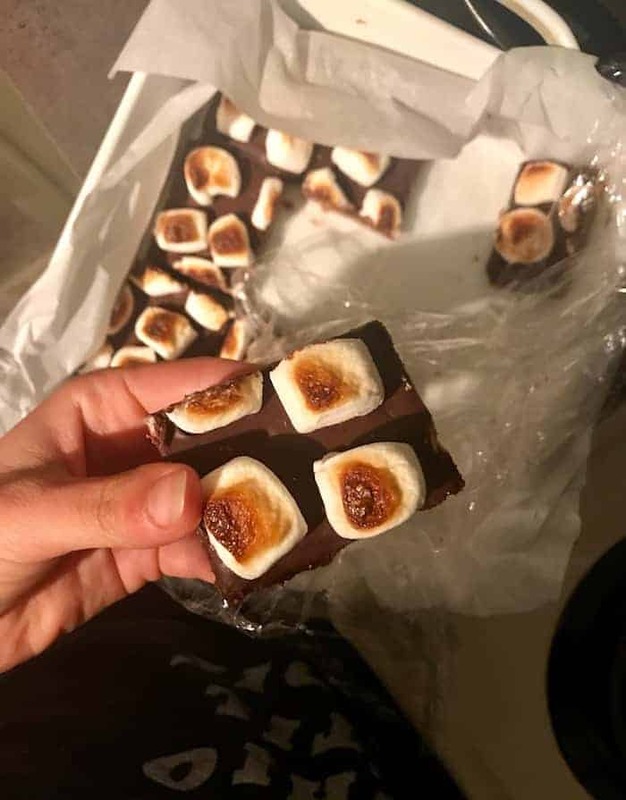 I think I looked for that skirt the last time you posted…still not available :( On a bright note, those S’mores bars look aaaaaaamazing!